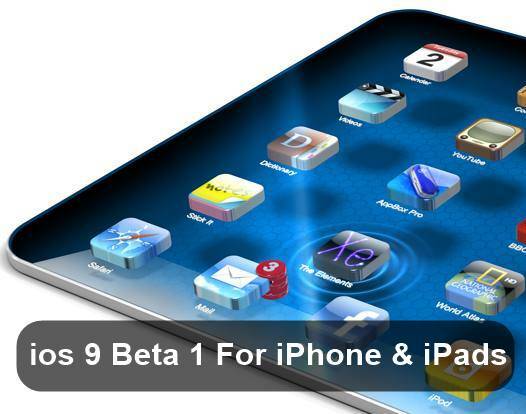 Today we are here with the discussion on Dowload Latest ios 9 Beta 1 For iPhone & iPads. As today almost every iphone,ipad and other idevice user is eagerly waiting for the latest OS update from apple that is ios 9. This update is completely coming for public in the month of july. But the ios 9 Beta 1 version is currently released and iphone developers can download it. But this version is not for public as you have to spend $99 every month if you want to become member in apple’s beta program in which you can have access to these beta version earlier you got the complete version of ios. Explore more at below. So developers get ready to test the latest and most cool version of ios till now that is ios 9. First of all checkout the device that are currently being supported by this OS. This Beta version is only for developers so the normal user can’t access this ios 9 till now but they will soon receive this update as according to WWDC 2015 held on yesterday ios 9 will be available this july publically. So above discussion is all about Dowload Latest ios 9 Beta 1 For iPhone & iPads. Now developers can easily check the functionality of this ios update and can help apple to remove bugs if any found. And other apple users have to wait for the launch of public version, you can also check Apple iOS 9 Release Date & Features. Hope you like the discussion, leave a comment below if you have any related discussion with this topic.